My girlfriend and I were very satisfied with our stay here. 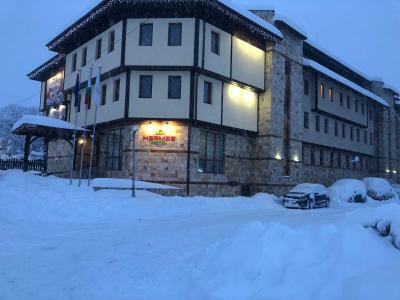 Hotel is OK, nice hotel for a winter break and skiing, not the best we have ever been in, but for the value, and offers, certainly one of the best, not just in Bansko. 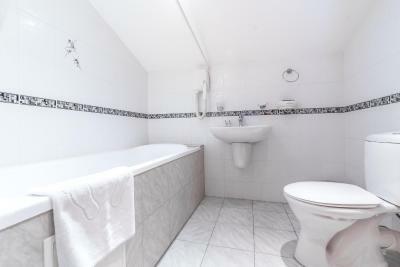 Very clean, with pleasant hosts, with great breakfast and dinner (we took half board). 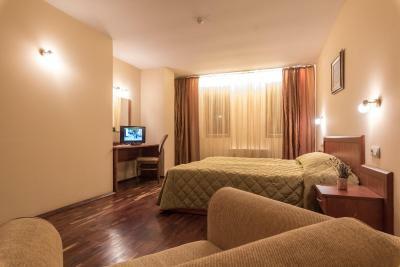 Rooms are clean, comfort, TV with all channels you're used to, internet is fast and free of charge. 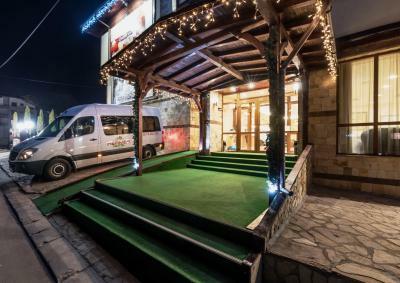 It's position is not so great to the main events in Bansko, but this is not a disadvantage... As opposite, it makes you go for walk for a bit after great dinner. 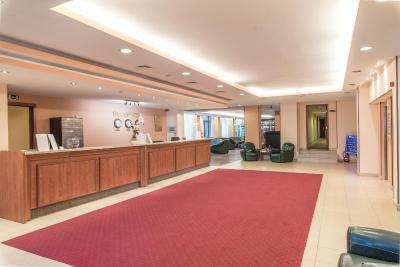 You can take a seat and chat with your friend in a nice lobby bar, play billiard or just go downstairs in a spa. We stayed only for 2 nights, and that was the best part, as we didnt had to spend more time there. The garage (which i didn’t use) was only 7 levs per night, which is ok, but you can find parking around the hotel. The facility is ok, with a paid parking underground, rooms were clean and comfy. A lot of satellite channels, but you cannot bring your movies on usb drive (restricted). Dinner was sometimes great. Nice hotel for a winter break and skiing. Good facilities and a very helpful and understanding staff. 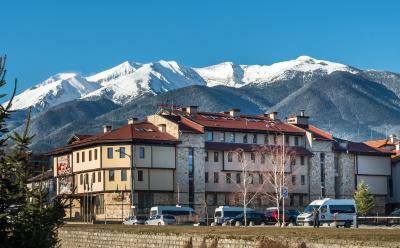 I would recommend it to anyone traveling to Bansko. 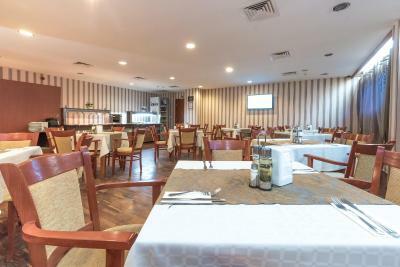 Everything was superb,frendly staff,clean and confort room,good meals,location. The food was very poor, the quality of food was very bad. Underground heated parking garage. 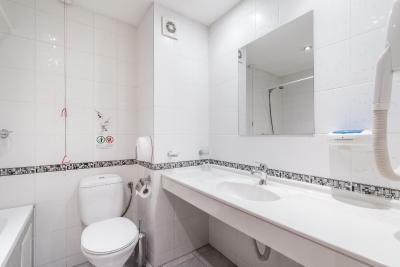 Sauna, massage, fitness facilities. Nice view of the mountains and river. Easy access to city center. 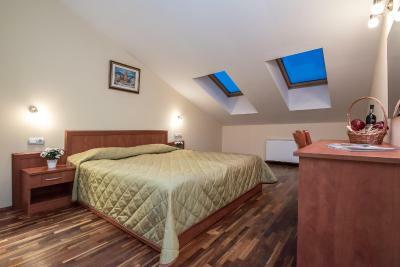 Very large rooms/suites. The evening meal and breakfast were included which was amazing for the price, although the evening meal wasn't too good. free ski bus to gondola. 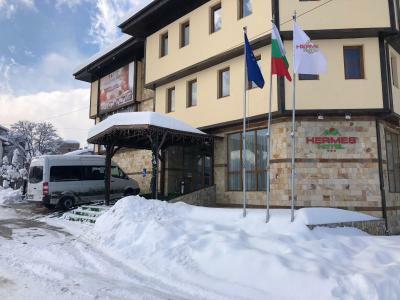 Hotel Hermes is located in the mountain resort of Bansko. There is a parking area for 35 cars and free shuttle to the ski elevator. 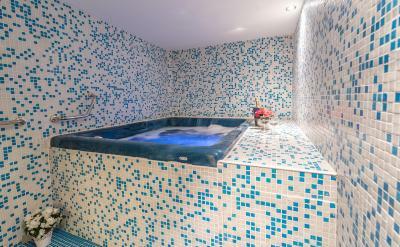 There are also spa services like sauna, steam bath and hot tub, which are free of charge. 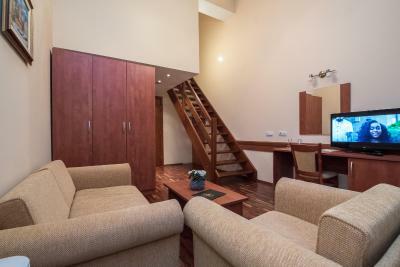 All units in this elegant and nicely decorated accommodations feature wooden parquet floors, air conditioning, seating area with a sofa and a TV with satellite channels. 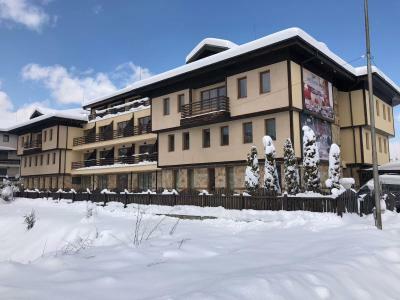 On site there is free of charge ski storage and fitness center. 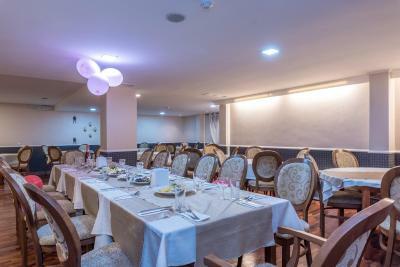 The restaurant at Hotel Hermes serves Bulgarian and international cuisine. Any additional older children or adults are charged BGN 45 per night for extra beds. Please note that an optional gala dinner is available on 25 December 2017 and 31 December 2017, at a surcharge. 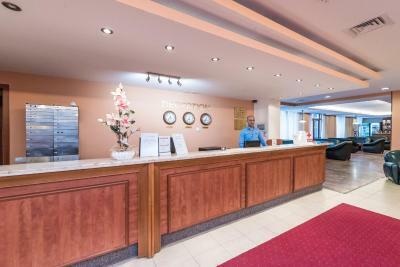 After booking, please contact the hotel for further information with the contact details provided in your confirmation. The breakfast was not so good and the cups for coffee was dirty. 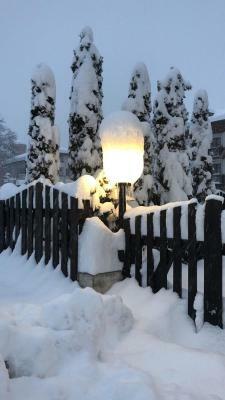 Location of the hotel isn't the best one.You need to have car to go on the slopes or around the town. evening meal wasnt so good, its details list how far away it is from the town centre rather than the gondola which is a long uphill walk. Just time of shuttle buses. Hotel has free shuttle that leaves at 8.30 and 9.30 (this is perfectly OK) and it returns at the hotel at 15:30 or 16:30. 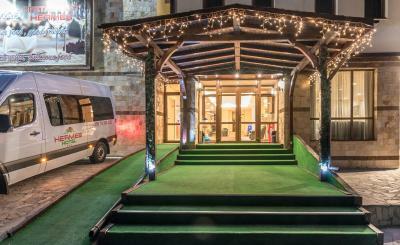 Well, we all are coming in Bansko for skiing... Mostly... If you're want to meet with shuttle bus at 16:30, you had to leave skiing and go for gondola some half hour (even more) before. For example, If you want to catch last lift at Banderiska at 16:15 for top you want be able to catch gondola before 16:45... Downhill you'll be some half hour later. If you miss shuttle, you can refer to taxi, which is relatively OK with price, some 7-8 levs. I have noticed that neighboring hotel has shuttle that goes up to the ski center. I think that this is not bad suggestion for Hermes. This offer doesn't need to be free... Or change returning time from 16:30 to 17:00 at least. Bus for the gondola needa t9 leave at 7.30am due to large gondola queues. Breakfast is solely aimed at eastern European guests. Had to bring our own cereal. However the guy at breakfast got us cold milk for the cereal and was very friendly. 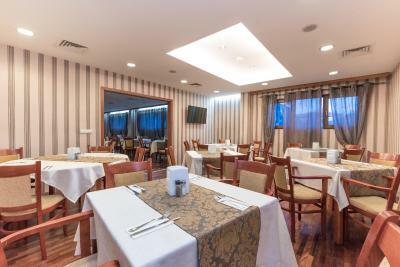 Very helpful and friendly staff, nice location, the mountain view and terrace. Breakfast was late if you want to go to the mountain early.